Proenza Schouler is a New York-based womenswear and accessories brand. Best known for its attention to detail, Proenza Schouler creates contemporary and refined clothing for the modern woman. With Big Apple Buddy’s personal shopping service, you can now buy the latest pieces from the USA Proenza Schouler online store anytime, anywhere. The best-selling Tiered Ruffle Dress Re Edition is made from Italian matte viscose yarn. It features cut outs at the waist and back that make this luxurious design flattering and classy. This dress comes from Proenza’s Spring 2016 line and is part of Proenza’s line of reissued designs in celebration of its 15 years in business. 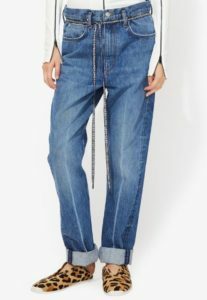 PSWL Paperbag Jeans give boyfriend jeans a whole new meaning. These jeans are loosely sculpted at the jeans and can be worn either low on the hips or cinched at the waste. The graphic shoestring belt is a fun twist to this simple and classic design. Proenza Schouler’s take on sweatpants is as luxurious and high-end as you’d expect. These fluid, yet form-fitting pants come in burgundy and black. 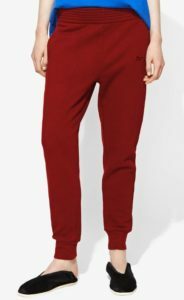 The dropped crotch and tapered cuffs make these sweatpants must-have lounging wear. The USA Proenza Schoulder online store unfortunately does not offer international shipping. Not to worry though! Big Apple Buddy, your personal shopper, can help you buy products from the USA Proenza Schoulder online store and ship them to your doorstep, no matter where you are in the world. We offer international shipping to over 110 countries including Australia, Austria, Azerbaijan, Bahrain, Belgium, British Virgin Islands, Brunei, Bulgaria, Canada, Chile, Costa Rica, Croatia, Czech Republic, Denmark, Estonia, Fiji, Finland, France, French Polynesia, Germany, Gibraltar, Greece, Greenland, Hong Kong, Hungary, Iceland, Indonesia, Ireland, Israel, Italy, Japan, Jordan, Kuwait, Latvia, Liechtenstein, Lithuania, Luxembourg, Macau, Malaysia, Maldives, Malta, Marshall Islands, Mauritius, Monaco, the Netherlands, Netherland Antilles, New Zealand, Norway, Oman, Poland, Qatar, Romania, San Marino, Saudi Arabia, Serbia and Montenegro, Seychelles, Singapore, Slovak Republic, Slovenia, Spain, South Africa, St. Lucia, Sweden, Switzerland, Taiwan, Thailand, the UAE, the UK, Vatican City, and Vietnam. If you would like to buy from the USA Proenza Schoulder online store, simply let us know which items you would like to order (by filling out the form below) and we’ll get back to you with a free international shipping quote within 24 hours!